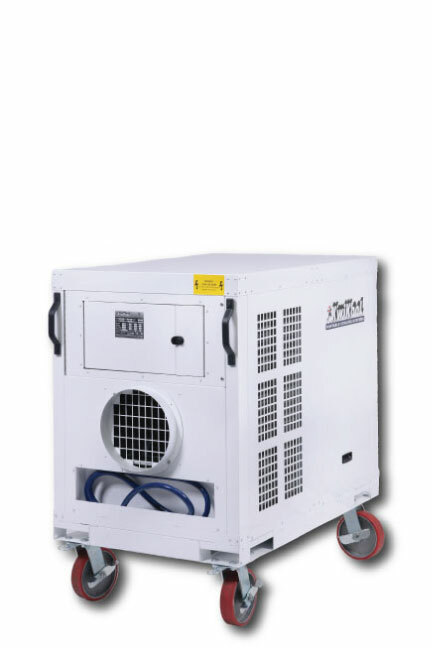 Air cooled portable air conditioner units are an extremely popular choice for spot cooling in a wide variety of applications. 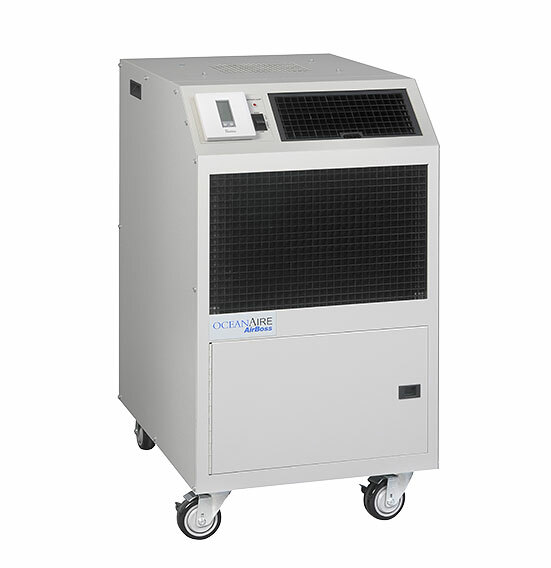 Air cooled portable air conditioner units are currently the most popular choice for climate control in computer server rooms or for use in rooms where there is other sensitive equipment because they do not require water lines as input and do not output waste water. OceanAire's CAC spot coolers use ambient air and convert it to cool air with internal condensers. These units require the use of air ducts to extract hot air from the unit and expel it from the room, so an air cooled air conditioner requires a means of ventilation. Typically, these portable air conditioner units are ventilated through a window. It is also common to extract hot air via a ‘floated’ ceiling where the hot air can be dispersed and not re-enter the room. Other ways of ventilation include through doorways, into garages or into any room which does not require cooling. Large air cooled portable air conditioners are often used outdoors and utilize duct work to bring cold air to a desired location. Our clients utilize this type of air conditioner for weddings, concerts and other outdoor events. Cool It Now offers the latest in portable air technology with KwiKool units. Manufactured in Houston, TX, KwiKool's units are designed to be the most efficient and powerful portable air conditioners in a size that will fit through a standard 36 inch door. The KPO series from KwiKool has an extremely small foot print that is ideal for difficult applications that require moving cold air to a hard to reach heat load, such as a sealed interior room. The unit can be placed outdoors with duct running into a building space or it can be placed inside a building and ducted into an interior space. The KPO Series offers advanced air flow capabilities, up to 50 feet cold air return and supply and up to 65 feet of hot air exhaust ducting.